A few minutes ago, the United States Senate voted 68-31 in favor of confirming Judge Sonia Sotomayor as the newest addition to the U.S. Supreme Court. 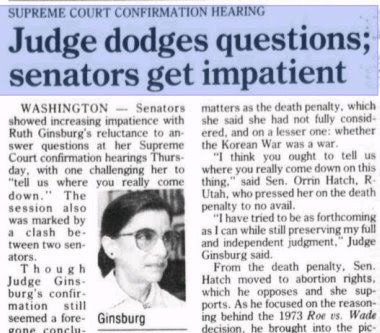 Judge Sotomayor's confirmation followed three days of debate on the Senate floor, and was preceded by a series of lengthy and widely-reported confirmation hearings in July. A simple search for [Sotomayor] on Google News yields articles from thousands of sources covering this developing story. Judge Sotomayor will soon become part of an elite group of Americans, as the 111th Justice to serve on the Court. The process by which new Justices are vetted and confirmed for this powerful body has long been a subject of intense media interest. As history was being made this week, I took a look back using News Archive Search's Timeline view for the term [supreme court confirmation]. 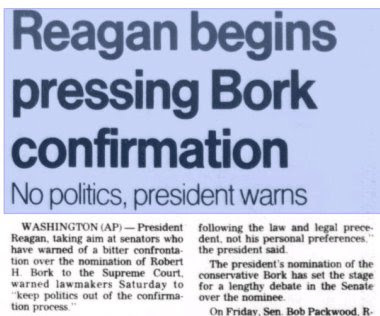 While browsing the archives, common threads in media coverage of Supreme Court Justice confirmation hearings jumped out at me. 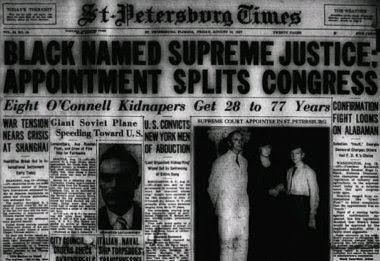 I've included some articles below from the last 75 years of Supreme Court History. These materials were made browsable via our News Archive Partner Program. You can easily click the navigation toolbar to zoom in and out on an article, or fit the entire newspaper page in your browsing window.